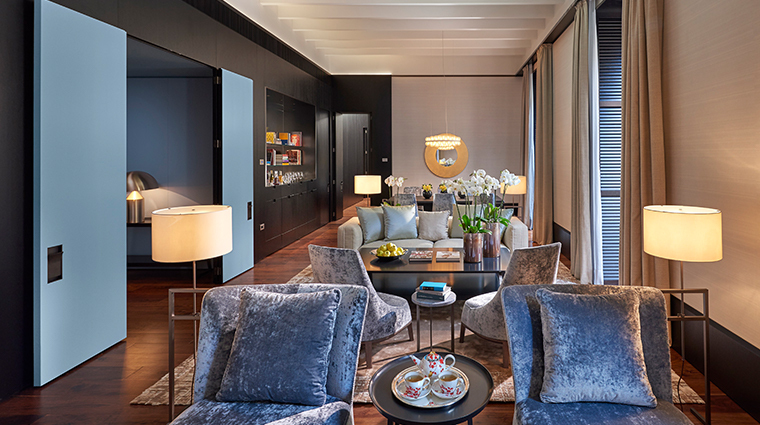 Mandarin Oriental, Milan mixes timeless Milanese design with Mandarin’s signature Oriental charm and legendary hospitality. 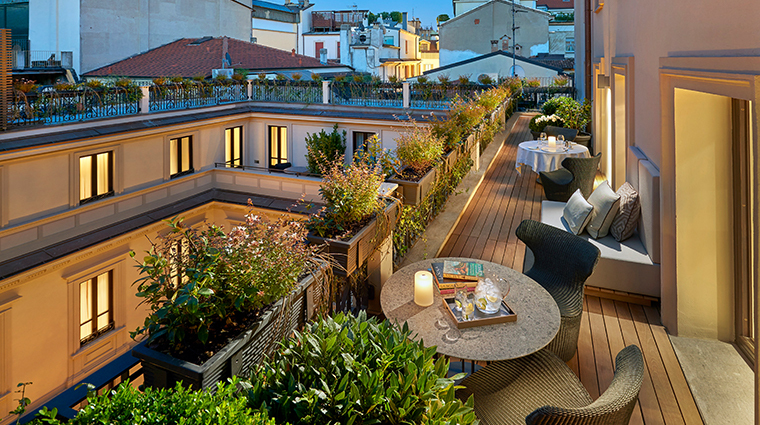 At the hotel, four interconnected 18th-century palazzos house 104 rooms and suites that overlook cobblestone streets and tranquil courtyards. 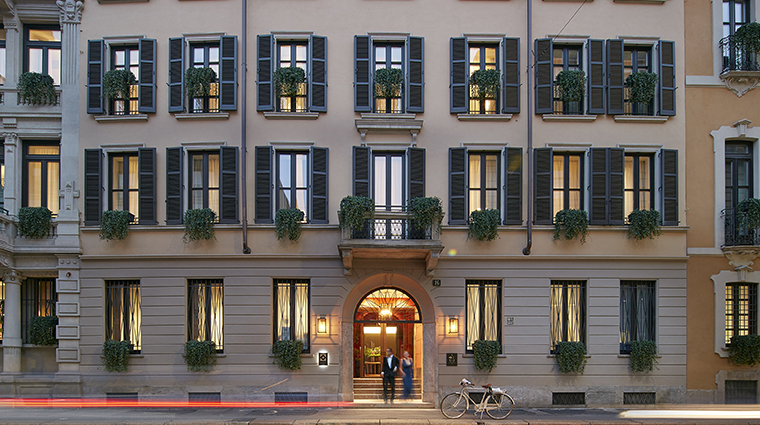 As a former bank headquarters, the understated main entrance is on a discreet backstreet next to La Scala opera house, near the Duomo and Via della Spiga (where luxury shopping dreams are made). 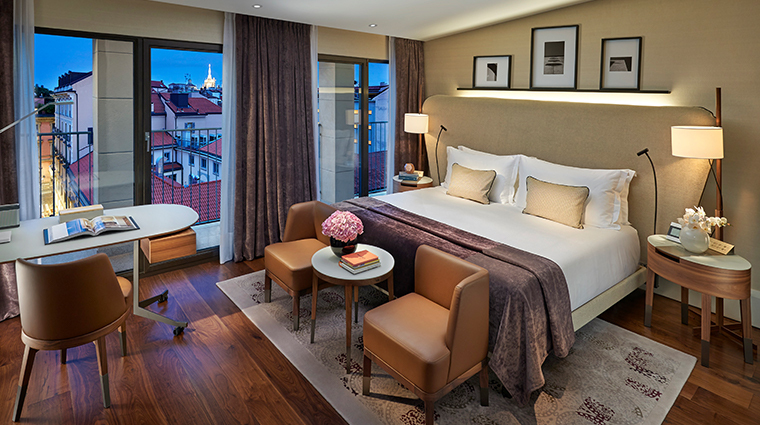 Designed by Italian Antonio Citterio Patricia Viel Interiros, its stylish contemporary-meets-classic look nods to Old World Milan with its feet firmly planted in the present. 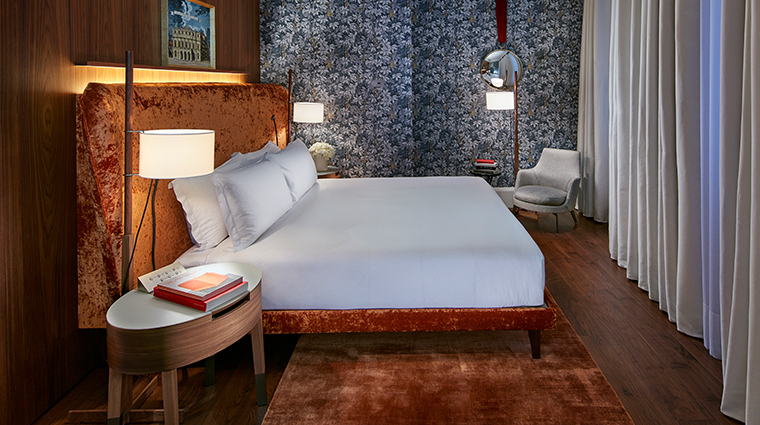 A luxe spa and hair salon, a refined Italian restaurant a bar with a lovely alfresco courtyard add to the considerable appeal to this glamorous new hotel. 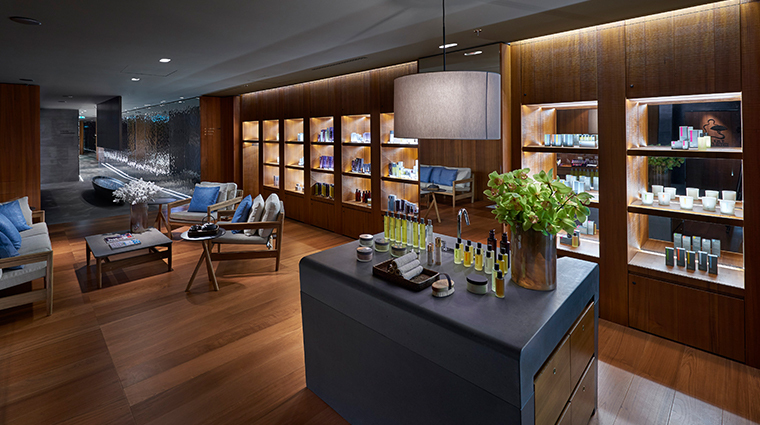 Variegated and granite stones and warm mid-toned wood reflect the subterranean spa’s age-old Oriental style, and its holistic treatments are based on the five feng shui elements. 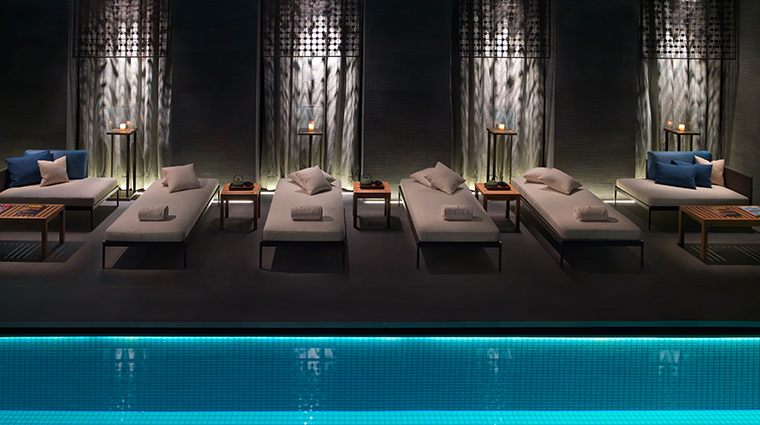 The Milan hotel’s indoor heated pool, laid with retro-looking turquoise tile, crowns a sauna, steam room and relaxation area outside of the spa. 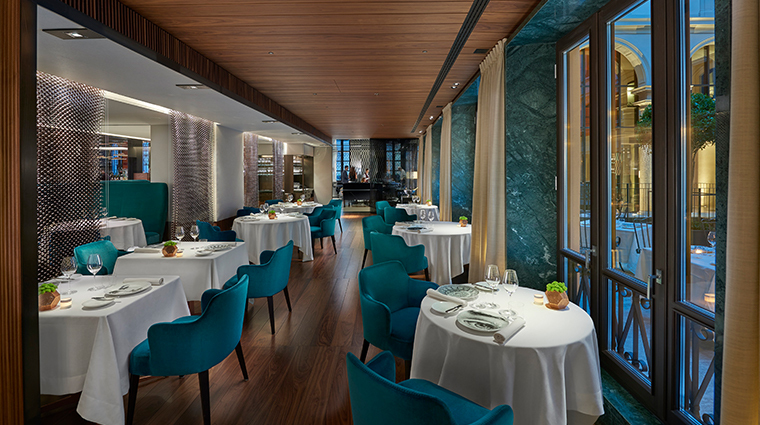 The Mandarin Oriental, Milan’s signature restaurant, Seta, features a wine list of over 500 exquisite labels. 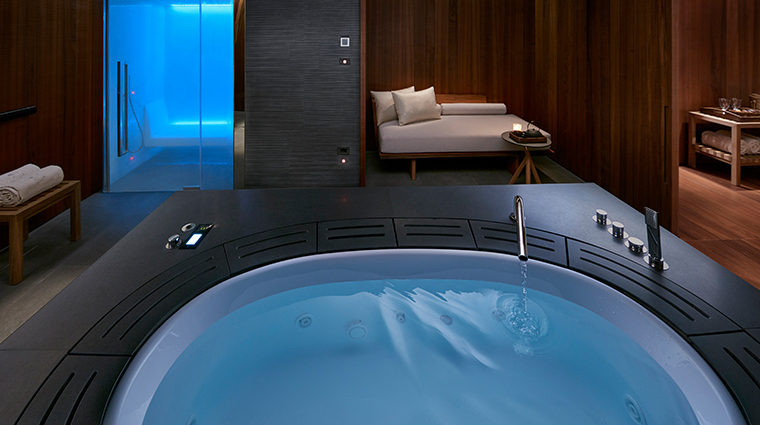 If you book a treatment — and we suggest you do — be sure to arrive at least 30 minutes early to relax in the spa’s steam room before consulting with a therapist and experiencing the signature pre-treatment foot ritual. 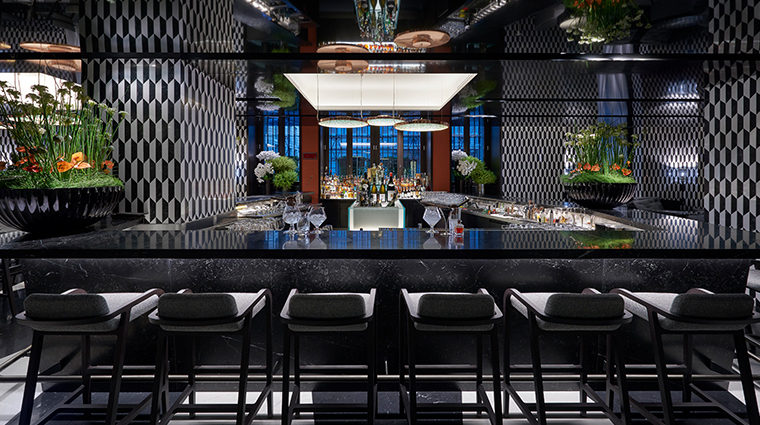 An intimate marble dining room is available for private parties and events for up to eight guests at the Milan hotel’s signature fine-dining restaurant, Seta. 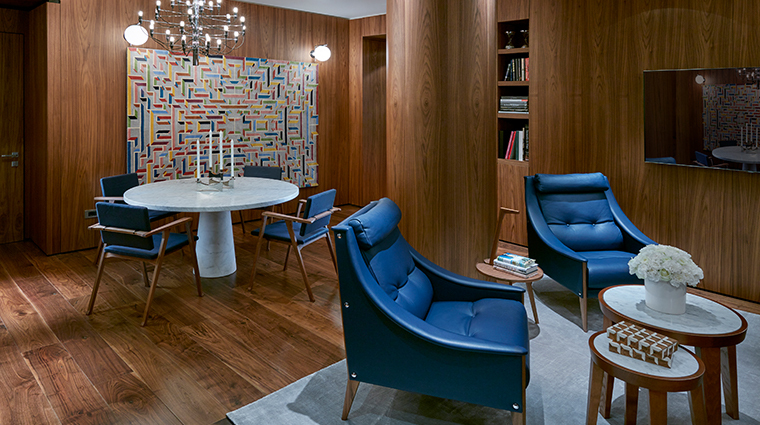 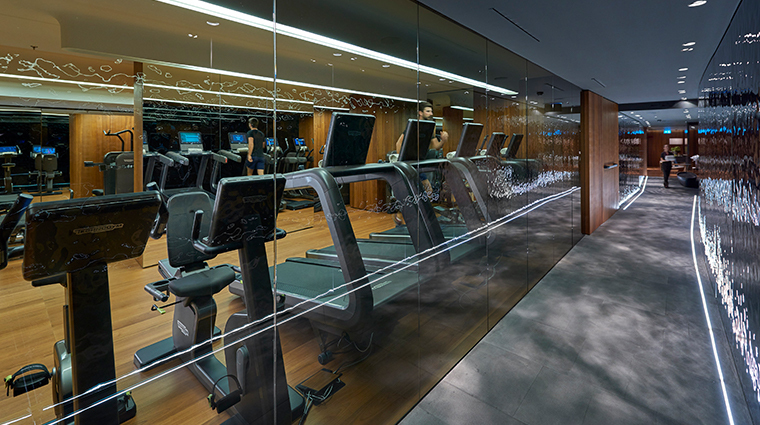 Post-treatment, opt for a mani/pedi or get your hair styled at the Massimo Serini salon. 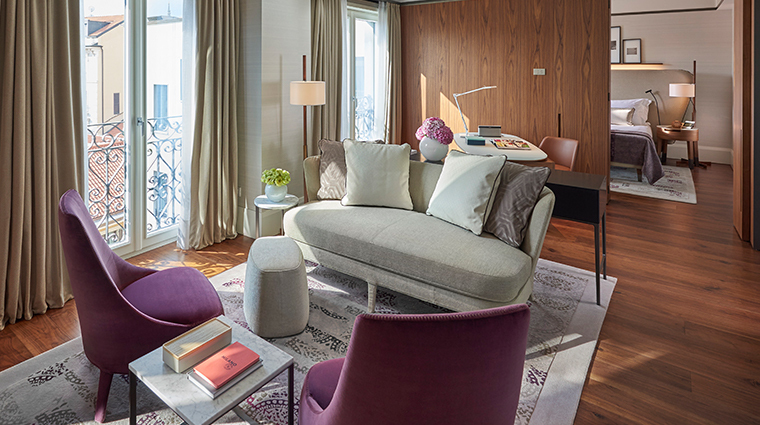 Lavish rooms with wooden floors, boiserie walls and black oak wardrobes are washed in muted beige and purple palettes and start at 409 square feet — spacious for old Milan. 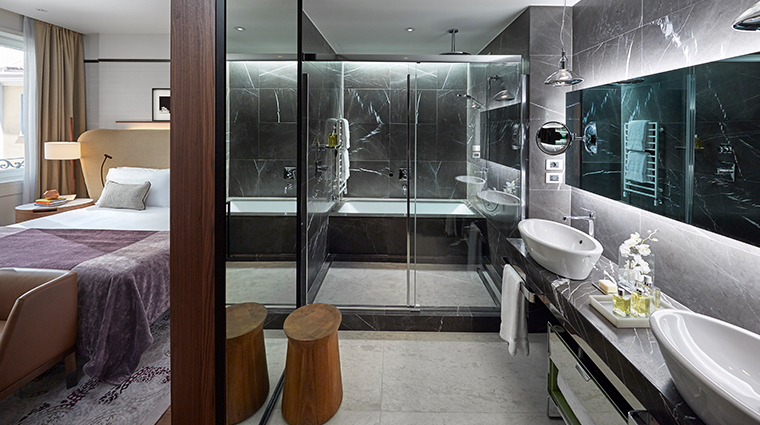 Bathrooms are black or white Italian marble with walk-in water closets, double sinks, Dr. Vranjes beauty products and a glass wall that becomes transparent or opaque at the push of a button. 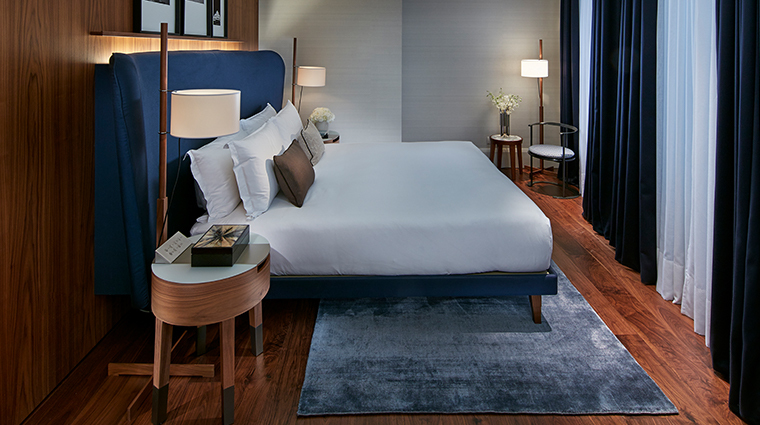 The 34 suites begin with the Junior Suite at 537 square feet and top out at the terraced Presidential Suite, which is 1,612 square feet and has a private kitchen and Brazilian marble bathroom floors. 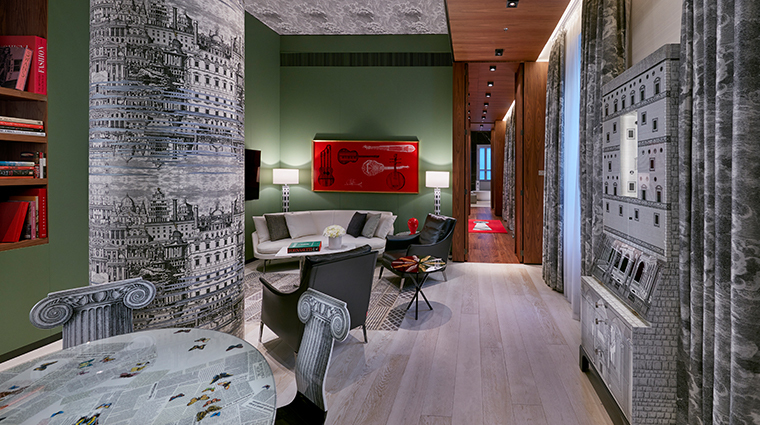 At the luxury hotel’s fine-dining restaurant Seta (it means “silk”), acclaimed chef Antonio Guida's contemporary Italian cuisine is blended with French techniques and served over plates from Milanese artist Piero Fornasetti. 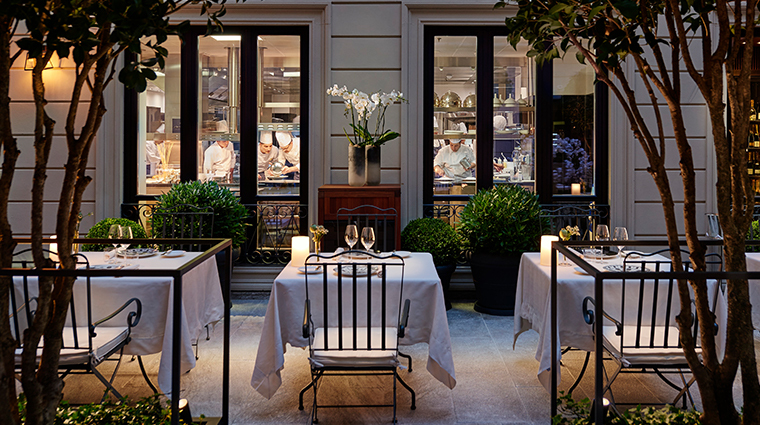 You’ll find dishes like spaghetti with beetroot cream and lime crustacean carpaccio mingling with others like veal sweetbread with dandelion sauce, or pigeon breast stuffed with duck liver escalope, pistachio sauce with saffron and rhubarb . 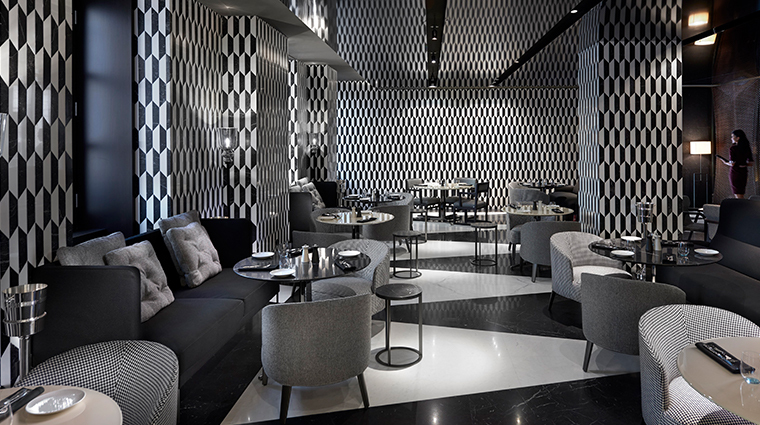 The design of the Mandarin Bar & Bistrot showcases walls crafted in black-and-white geometric mosaic marble. 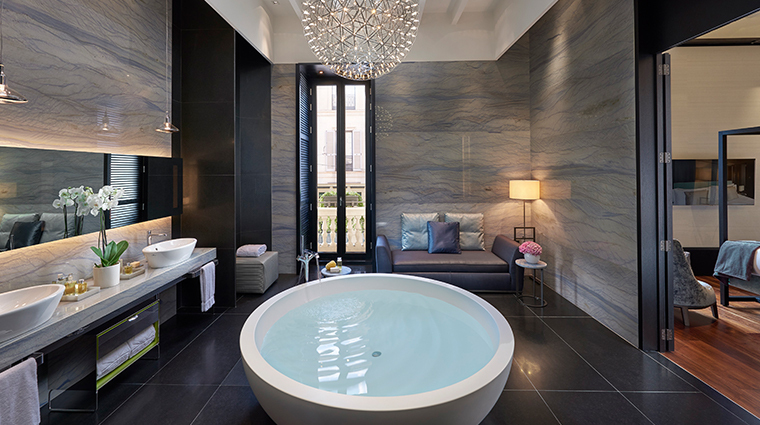 The black laminate trompe l'oeil ceiling creates the illusion of an endless chamber above a generous black marble bar flanked by lounge areas. 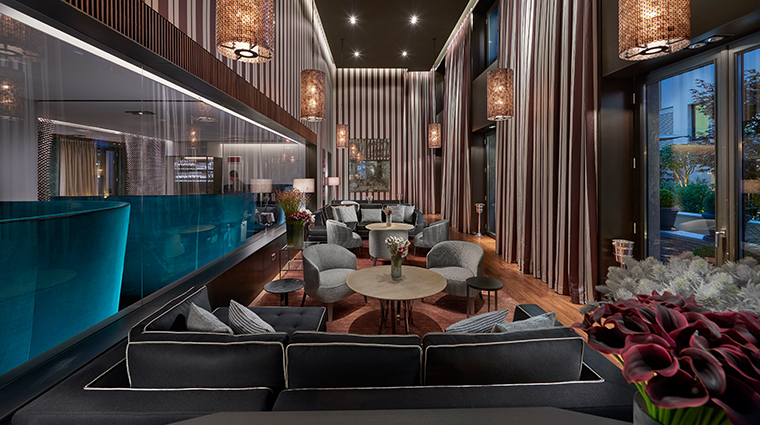 Contemporary, relaxed bistro fare is what’s on offer here — expect flavorful dishes like ravioli stuffed with eggplant, tomatoes and burrata cheese, and grilled calamari with peas and mint.